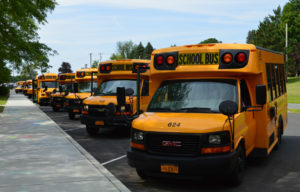 The East Greenbush CSD transports nearly 4,500 students to more than 50 schools encompassing four counties twice a day. Our department is proud of our DOT inspection rating, which is consistently over 95% (with 100% being the highest rating). Our fleet of 120 school buses are maintained by experienced district mechanics and inspected by the DOT every six months. We are proud of our safety record and service to the community. Our number one goal is to provide the safest transportation possible for our children! If you are having difficulty locating your student’s bus route, or have any other questions or concerns, please do not hesitate to call us at (518) 477-9288. Be safe and enjoy the school year! 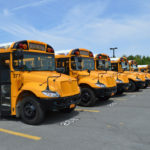 Transportation Requests for 2019-20 Due by April 1- Parents of resident students in need of special transportation arrangements, such as private and parochial school transportation or transportation between school and a daycare center or placement, for the school year starting in September 2019, should request this transportation in writing by no later than April 1, 2019. 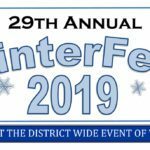 WinterFest – January 18-20- East Greenbush Central School District is hosting its 29th annual WinterFest the weekend of January 18-20. There will be food, crafts, activities, bounce houses and fun for the whole family! 2-Hour Delay – Tuesday, November 27- East Greenbush CSD will open with a 2-hour delay on Tuesday, November 27 due to the weather.